Interesting piece. I'm a member of FBC Durham and the following are a few short explanations that I hope will help you better understand FBC, its plans, and its mission. 1. FBC is not "itching" for a new sanctuary. We are steadily growing and eventually will have need for increasing the capacity and amenities of our facilities in order to meet the increased demand created by a larger membership body. However, any large construction projects of this sort are barely a blip on our radar screen, so far. 2. FBC is hugely concerned with ensuring that any physical changes to the existing structures and any construction of new facilities be performed in such a manner as to strengthen the fabric of downtown. To this end, we have been actively engaging in dialogue with the various members of the COD planning department, hoping to foster open exchange between the COD and FBC. If we can strengthen Durham through any of our future development, we earnestly desire to do so. 3. FBC is working with an Architect to develop a master plan for our facilities. This is a 20+ year outline of what types of facilities we may be looking at expanding, renovating, or adding to our physical plant as our congregation grows. This master plan will not offer specific design solutions for particular structures, but, it will be sensitive to the historic importance of FBC's current structures while seeking to strengthen the church's presence east of Roxboro and its involvement with the downtown west of Cleveland. 4. There is nothing we are concerned with less than "packing in more people from afar." However, "packing in more people from" the depressed, hurting, and needy east side of Durham weighs heavily on the hearts of both our members and pastoral staff. I hope this gives you a slightly better understanding of FBC and its future plans. You are cordially invited to join us any Sunday or Wednesday evening for prayer, Bible study, and worship. We ache for the suffering masses surrounding us. Perhaps you would consider helping us "reconnect the residential areas east of Roxboro" with the abundant life found in Christ. Maybe then, He will work to return the prosperity and growth to these neighborhoods that is being experienced, already, elsewhere in Durham. Glad to hear that you are concerned with strengthening the fabric of downtown. Perhaps you aren't aware of how damaging the entire block of surface parking is to the east side of downtown. I hope you expeditiously move to develop it - hopefully with mixed-income, mixed-use development. I am sure the neighbors would welcome more of your congregation into their community. I would also like to make you aware that many members of the community to your east are building and rebuilding their neighborhood through their hard work and good hearts - regardless of their particular faith. I'm sure they wouldn't mind if you attended one of their neighborhood potlucks so you could learn more about your neighbors - no requirement to participate in their faith rituals. They are a diverse group of people that could use services that most neighborhoods have more access to - like grocery stores, restaurants, laundromats, etc. I point this out to make you aware that, as you move forward, you should listen to your neighbors, and only build things that your congregation would not hesitate to build in their own neighborhoods. Yeah, I hate that big empty parking lot to our North, as well. I've been pushing for a skate park and basketball courts over there, until we've a need to develop it. Unfortunately, the city loves all that parking. I guess we give them a cheap lease or something. It is my hope that whatever FBC builds (if and when it builds), will be useful for the church body, the surrounding communities, and the City of Durham at large. When the final master plan proposal is presented, I'll try and remember to let you know so that anyone interested can have a chance to see the direction that FBC's physical plant might take! As someone who grew up among the FBC congregation during a very volatile time in Durham's, and America's social & political history, I have to confess to have very strong feelings about the church's historical role during this time on many levels, that have profoundly informed my values and my identity, though in ways that were likely not intended by the church. I am very sensitive to the role the SBC did--and didn't--play, in the fate of the homes that were bought and demolished to clean out the "riff raff" as a result. I remember well the discussions about it around me in the church halls. It was the behavior of the church "leaders" during those years from 1968-1972 that forever drove me away from the church. I knew many of those poor families that were displaced from many of those homes, and I know what happened to many them after they were pushed out. I went to school with those children; they were my friends, and it drove me, then only an 11-12 year old girl. The world was upside down, and the SBC and the majority of people in FBC landed on the wrong side of right. I came to prefer the company of those families, in those decrepit homes, however rundown, to the church "family" that surrounded me during that time. I often sneaked out of church to spend that time with those families. I truly hope that the FBC demonstrates a sensitivity to supporting the community that surrounds the church, not only those of its members. I would really love to see the church make real efforts to integrate with the surrounding commmunity and enrich it. When I was a child, I remember well the church bussing poor white kids & families to the church from east Durham. I also remember how the church made it a point of announcing in church how they had bussed these people in to "bring them to Jesus." Having been one of those very poor children coming to church, I can't tell you how humiliating that was. I can't begin to describe to you how painful it was to be given hand-me-downs from the wealthier families and then be jeered and taunted when I showed up in church wearing them. And while the church was bussing in white families, we were also working to bull doze the homes of the poor black families who could have walked to the church had they been welcome. We did NOTHING to help them. My pet name for FBC back then was "The Millionaire Club." I hope that FBC has experienced a great deal of cultural change since that time. I did not intend this note to be a flame, and I truly apologize if anyone is offended by my emotional reaction to the church's tainted past. I hope that FBC's concern for the poor and the needy is now truly color blind, blind to class AND gender, however, what I hear of FBC's history in recent years and SBC in general tells me the jury is still out on whether FBC will get there in the near future. With all of the wealth that the church has accumulated over the years, surely the church is capable of making a significant effort in this regard. The church was designed by R. H. Hunt of Chattanooga, Tennessee. The presentation drawing was published in Mouzon William Brabham's Planning Modern Church Buildings (1928). 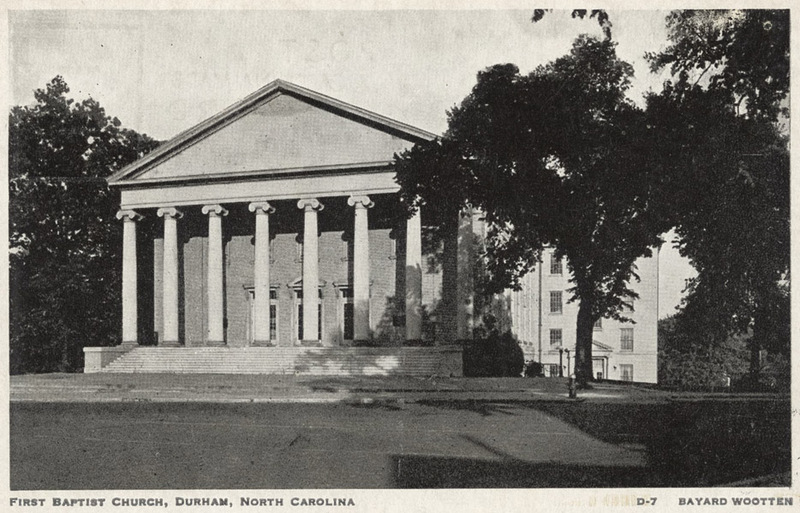 I've recounted the history of the First Baptist Church in Durham in detail here. The church decided to move from its N. Mangum St. location during the 1920s and construct a larger sanctuary on Cleveland St. Although Cleveland St. was a residential neighborhood of large well-appointed houses, it appears that there was a previous Primitive Baptist mission located at or near this site. Rendering of the proposed new building, 1924. 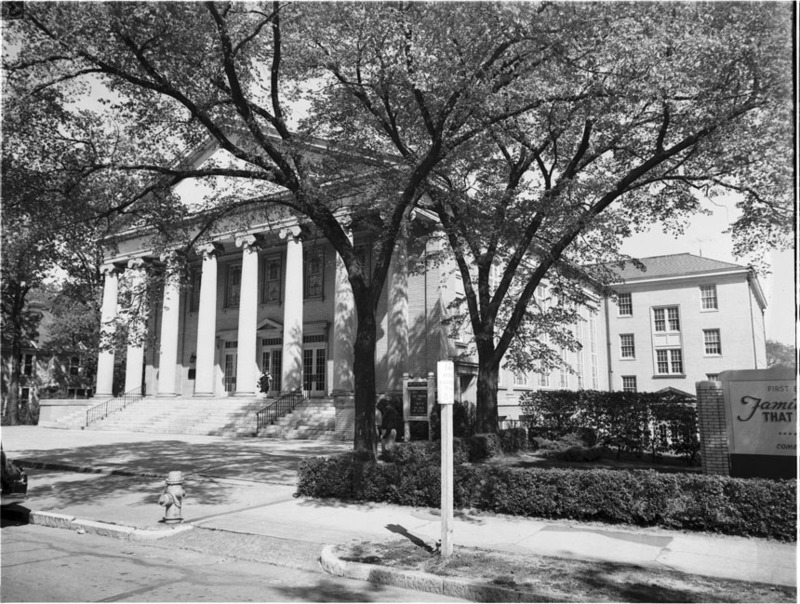 The resulting large, neoclassical structure was completed in 1927. Below, a clip from the H. Lee Waters films of Durham, showing kids playing and rollerskating in front of the church. In the northward-facing shots, you can see the Blackwell Markham house in the background. View of the northeast portion of downtown ~1960, with First Baptist at the end of Chapel Hill St. Notice the surrounding residences. 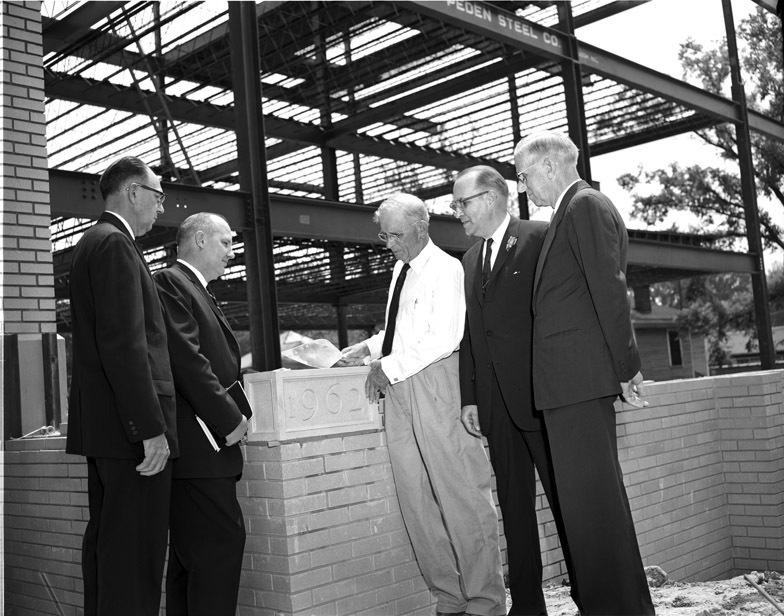 An education building wing was added to the south side of the church in 1962. The loop and the conversion of the last block of East Chapel Hill St. into a parking lot have somewhat diminished the effect, but this building remains the best remaining terminating vista in downtown - from the moment you cross Five Points heading east on Chapel Hill St., you see this impressive building at the end of the road. First Baptist is also likely the largest private landowner on east side of downtown, owning approximately two city blocks, the vast majority of which is parking. Across that gulf of parking are the remaining houses of Cleveland St., in the Cleveland St. portion of the Cleveland-Holloway historic district. The big and beautiful houses that once surrounded First Baptist were demolished via urban renewal, the Loop, and by the church itself. Rumor on the street is that the church is itching for new sanctuary. I don't know if they would plan to build it on their vacant block to the north or not. I would encourage them to think more broadly. It has been awhile since I've directly criticized churches on here - although Housing for New Hope arose somehow out of (and I may not have this right) First Presbyterian and St. Philips. But churches are often the last ones standing in an obliterated urban area, and accumulate large land holdings. Too often, they create large landscapes of surface parking that are little utilized outside of Sunday. At worst, they are, nationally, frequent agents of demolition of historic structures as they expand. Building community, a mission for most churches, is a broader endeavor than fellowship among the people who drive to the church and providing charity. The physical environment surrounding churches is extremely important in determining the success of the surrounding neighborhood. What is needed on the majority of the big, nearly empty lot to the north of the current First Baptist sancturary is mixed-use (corner grocery + residences), mixed-income development that will reconnect the residential areas east of Roxboro (and the Holloway portion of the historic district) with those west (the Cleveland St. portion of the historic district, which connects to Little Five Points.) I hope that they will consider reconnecting community as part of their mission - not just packing in more people from afar on Sunday. The church was designed by R.